We got there a bit late, courtesy of the plonkers who decided to dig up one of the bridges on the A14, neglecting to advertise this fact at a place that would have allowed us to make a decision to go a different route. However, we just got there in time. After the safety briefing we took our time and got the car ready. One small problem was that I only just scraped through the noise test; I’ll need to repack the silencer I think for proper action later in the month. The day was vastly improved by having Adrian, Duncan and Charlie there to help for the day. It was amazing to come into the pits and just sit there while the dampers were adjusted. I spent a lot of the day twiddling with dampers trying to get a decent setting. Eventually ending up essentially where I’d finished last year. That’s no bad thing though. I’m pretty sure that the car felt more stable at the rear than it did last year. (Long term readers will remember last year’s first track outing was accompanied by a lurid spin under the bridge at Snetterton.) 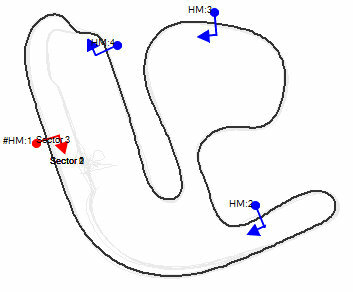 This time I was approaching the hairpin at the bottom right of the track map just shy of 130mph and I found I could just leap onto the brakes (you had to) without any issue about loss of stability. Most interesting, though, is the undertray after I got home. I made the new undertray as wide as I could manage it and I was always unsure if the sides of it were as well supported as they might be. They’re really only supported by the front of the diffuser panel. Looking under the rear of the car today the sides of the panel have been folded down by the effects of the air, what’s more in a rather interesting pattern as you can see in the photo. This has happened on both sides of the car and not just the one in the photo. This has the interesting aspects of making the undertray not RGB-legal as it’s more the 10mm away from the horizontal. However, it should be easy to fix. I’ll bash it straight with a hammer and use some aluminium angle to stiffen up the edges. Worst thing, though, was that despite my attention to the engine mounts over the winter and the careful re-alignment of everything the driven sprocket still seems to be suffering slightly from wear. (Although, to be absolutely fair, I don’t think I paid enough attention to looking what it was like before the trackday.) I think I might try and get a hard-anodised sprocket to compare with the current ones. Are you sure thats been done by the wind? Looks like somethings hit it to me and there look to be rub marks on the tyre, though it’s hard to be sure from the photo’. Is it not a case of tyre deflection and rubbing on the under-tray? I wondered that too, especially after taking the photo. However, having looked hard at it I’m sure it’s the wind. The thing is, the bent bit is in the middle of the wheel and there isn’t any tyre in the vicinity. (And what looks like a dent is some sort of weird artefact of the lighting.) I spent ages convincing myself of this. I think the scuff marks on the tyre are due to the fact that this was originally one of my second set of tyres; it spent most of last year being put on and off a tyre rack and being stacked up, side to side, in the garage. Certainly looks like impact damage which has stuck between the wheel and the ally sheet but, as you say, if it has happened both sides it would be unlikely to be impact damage. Odd. Did it have a lip turned up at the edge before or are both bends of the S new? I’ll believe it’s the wind if it’s only put the one bend in it, but you’ll have more luck trying to convice me it was done by pixies if its both bends. looks like impact from above. I am struggling to believe the wind idea. any chance the suspension could droop that far on a corner? You mean bump, but not a chance. To test the “wind” idea, get a strip of 1.2 mm ally. Drive along at 130 mph, wind down the window and stick it out of the window. See what happens? A cubic metre of air, an awful lot of which is rushing past at 130mph (which is about 60 metres per second and is above your terminal velocity should you jump out of an aircraft), weighs about 10kg. That’s a lot of stuff. There’s a reason why wings hold hundreds of tonnes of aircraft up and push F1 cars down with a force of tens of thousands of newtons. That bit of ally is easily bent. 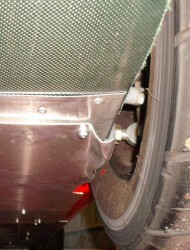 Note, though that the diffuser panel and the ally hinge, which is a lot stiffer, has not bent. If this was due to contacting something then they would be. In fact, those bits are closer to the tyre than the part that’s bent. No, they’re at the top of the wheel, this is only 75mm from the ground. As before, there’s no reason why diffuser attachment, behind the undertray, would be OK, but the undertray itself wouldn’t be. Still an odd shape for wind damage, you would expect it to be deflected but not curved like that.